you’ll begin to dream again. Is it possible to change your outlook on life in a mere week? Can someone follow the VIM personal development program for only 7 days and start noticing life-altering results? Can the VIM tools and procedures be integrated into my daily schedule in just 168 hours? We are so confident that you’ll find our program, well…ESSENTIAL in your life going forward that we’re willing to give you free access for one week. (except the VIM ADVANTAGE money saving incentives). 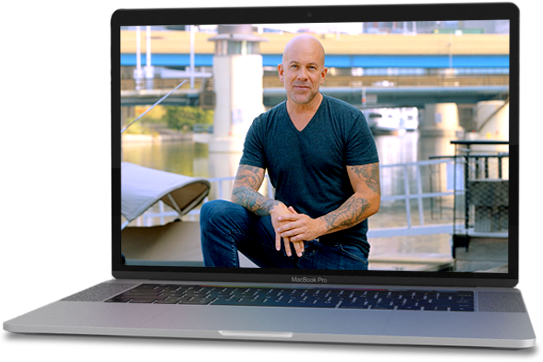 You’ll get the starter set of Vim Effect’s personal transformation program, including information and exercises created especially to boost your life with an immediate jump start. One of the favorite features. 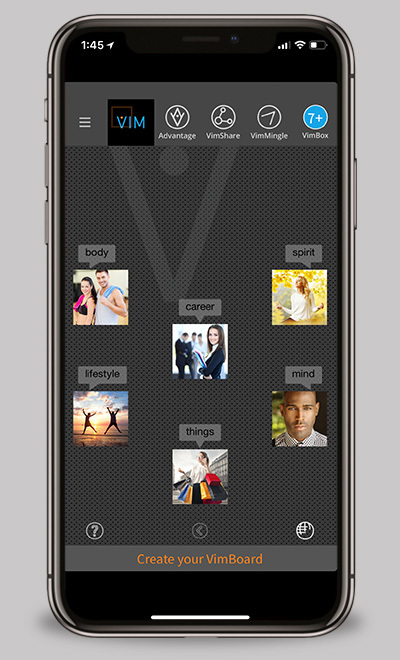 You’ll be able to create your own VimBoard goal tracker which enables a personalized vision board on the desktop of your mobile device. See the goal, get the goal. No matter what you desire, the VimBoard helps make it your reality. With this VIM “key to the city” you’ll become acquainted with the vibrant VimCommunity. Share your hopes, dreams and possibilities on the VimBlog. Get questions answered. Consult and make new friends around the globe. 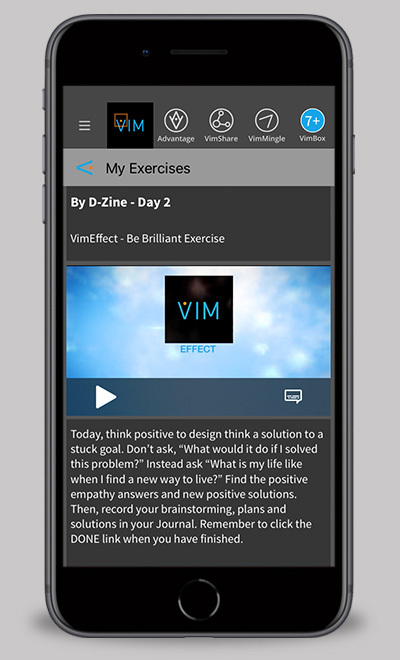 The incredible Vim Mobile App allows you to jot down your insights, growth, plans and revelations anywhere and at any time. Our system keeps it all organized and accurate. Meet VimCommunity people right in your local area. Grow your circle of influence and connect with like-minded friends. You can also message each other through VimMessenger for one-on-one discussions. Authentic happiness starts from the inside out. VIM ESSENTIAL is your step-by-step guide to unleashing that ultimate you.